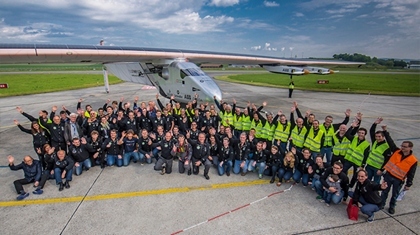 All photos © Solar Impulse. Swiss explorers Bertrand Piccard and André Borschberg are the founders, pilots and driving force behind Solar Impulse, the first aircraft of perpetual endurance, able to fly day and night without a drop of fuel. Visionaries with a family heritage of exploration and pioneering spirit the idea of a solar powered aircraft was born in Bertrand Piccard's mind after the success of the first non-stop round the world balloon flight. 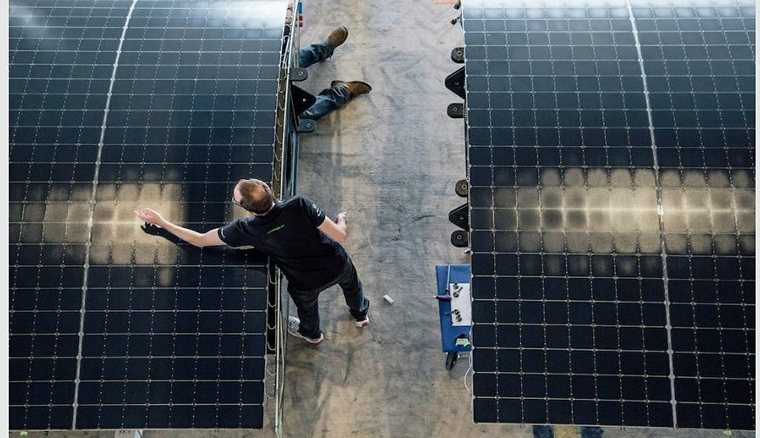 By attempting the first Round the World Solar Flight, they want to demonstrate that clean technologies and renewable energies can achieve the impossible. For the Solar Impulse team, pioneering spirit and innovation can change the world. The Round the World Solar Flight represents a journey of approximately a 35,000km. 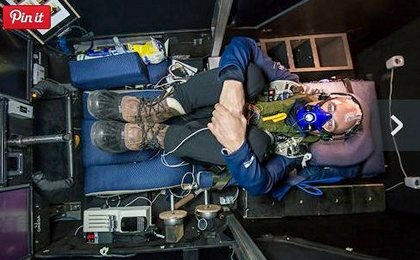 Although achieved in several legs, Bertrand Piccard and André Borschberg will accumulate around 500 flight hours in the tiny 3.8 m3 Solar Impulse 2 spending up to 5 or 6 days and nights in a row in the single seater cockpit whilst with no pressurization system in weather conditions ranging from -40°C to +40°C. They will have 6 oxygen bottles onboard, food for a week as well as a parachute and life raft in case of a emergency. 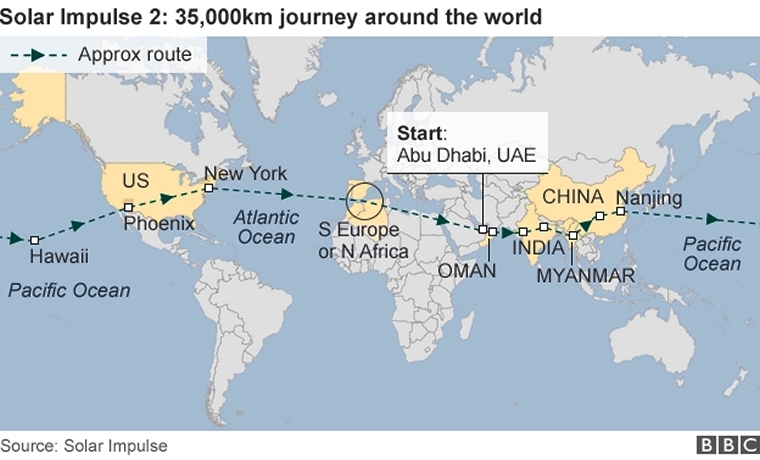 The Round-The-World flight started from Abu Dhabi, on March 9. The route includes stop-overs in Oman, India, Myanmar and China. After flying cross the Pacific Ocean via Hawaii, Si2 should fly across the U.S.A. and over the Atlantic Ocean, heading back to Abu Dhabi. Solar Impulse 2 was built to take up the challenge of achieving the first round-the-world solar flight. 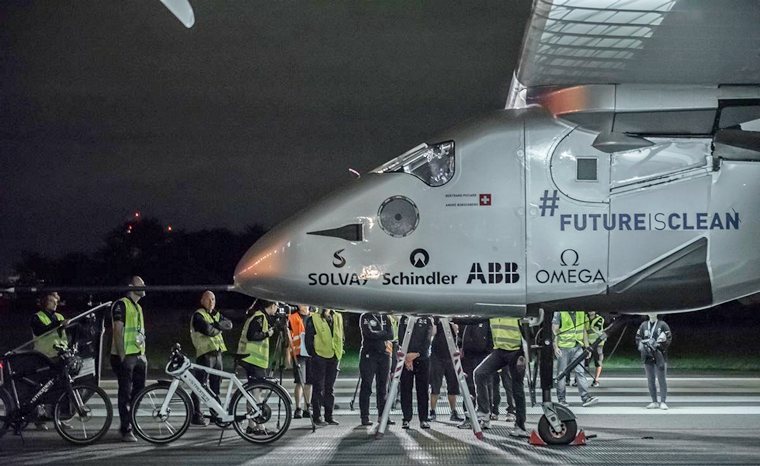 This revolutionary airplane will have to do what no one has ever done before, fly through 5 consecutive days and nights without using any fuel, so as to cross oceans from one continent to the next. 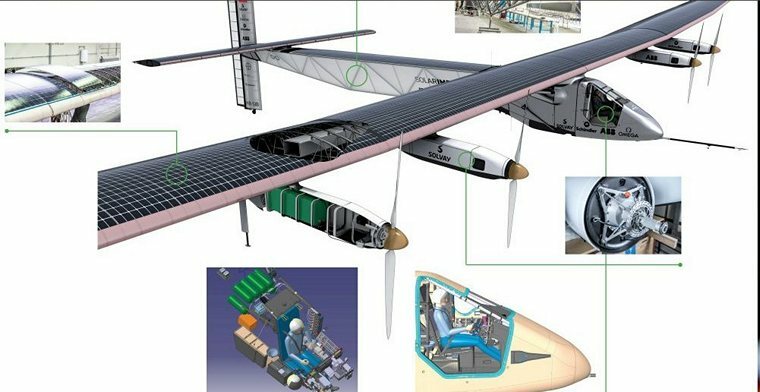 Whilst Solar Impulse is not the first solar aircraft project; it's certainly the most ambitious. It is a real airborne technology laboratory with virtually endless endurance, capable of crossing oceans and continents by remaining in the air for several days and nights in a row. This requires the optimization of new kinds of technology and a drastic reduction in energy consumption. Solar Impulse's 80 engineers and technicians, under André Borschberg's leadership, have had to apply highly innovative solutions. Getting the dream of the ground took 12 years of feasibility study, concept, design and construction by 50 engineers and technicians, 80 technological partners and more than 100 advisers and suppliers. One prototype, Solar Impulse 1, registered as HB-SIA and Solar Impulse 2, registered as HB-SIB the example that was to undertake the ground-breaking flight was build. Solar Impulse gathers its power from the sun by means of a 269.5 m2 array of more than 17,248 monocrystalline silicon cells each 135 microns thick mounted on the wings, fuselage and horizontal tail plane, providing the best compromise between lightness, flexibility that collects up to 340kWh of solar energy per day. The energy collected by the solar cells is stored in lithium polymer batteries, whose energy density is optimized to 260 Wh / kg. The batteries are insulated by high-density foam and mounted in the four engine nacelles, with a system to control charging thresholds and temperature. Their total mass amounts to 633 kg, or just over a quarter of the aircraft's all-up weight. In order to save energy, the aircraft climbs to 8'500 m during the day and descents to 1,500 m at night. In order to maximize the aero dynamical performance, the plane is built with a wingspan of 72m: wider than that of a Boeing 747 Jumbo Jet! The power stored in the batteries are fed to four brushless, sensorless motors, each generating 17.4 hp (13.5 k), mounted below the wings, and fitted with a reduction gear limiting the rotation speed of a 4 m diameter, two-bladed propeller to 525 rev / min. The entire system is 94% efficient, setting a record for energy efficiency. At maximum altitude Solar Impulse can fly from 57 km/h (31,5 Kts) to 140 km/h (77 Kts) whilst at sea level speeds range from a minimum of 45 km/h (20 Kts) to a maximum of 90 km/h (49 Kts). The engineering team led by André Borschberg managed to build the entire structure proportionately 10 times lighter than that of the best glider. Every gram added had to be deducted somewhere else, to make room for enough batteries on board, and provide a cockpit in which a pilot can live for a week. In the end, it is of the weight of a small van: 2'300kg. extensive used was made of sheets of carbon, which at 25g/m2 weigh only a third as much as sheets of printer paper. The airframe is made of composite materials: carbon fibre and honeycomb sandwich whilst the upper wing surface is covered by a skin consisting of encapsulated solar cells, and the lower surface by a high-strength, flexible skin. The 140 carbon-fibre ribs spaced at 50 cm intervals give the wing its aerodynamic cross-section, and also maintain its rigidity. On 3 July 2015 Solar Impulse with André Borschberg at the controls Solar Impulse 2 landed safely in Hawaii having completed a third of its journey around the world. 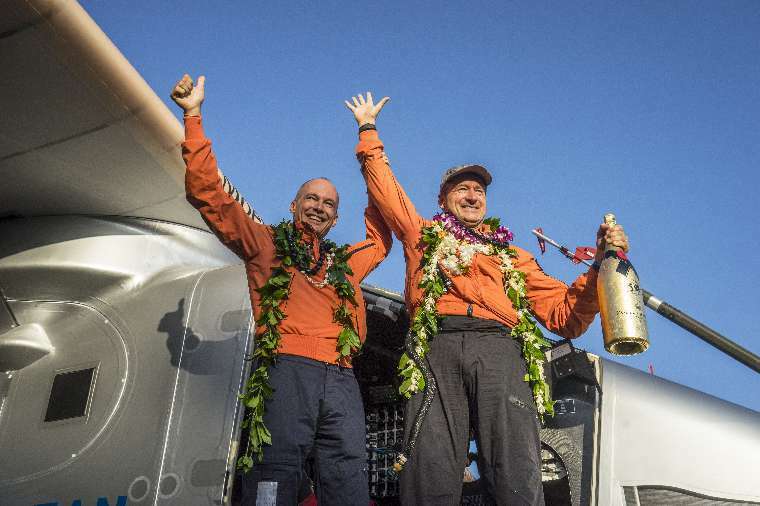 The leg from Nagoya, Japan to Hawaii is the longest and most difficult leg of the Round the World Solar Flight. It took Andre 117 hours and 52 minutes of nonstop flying over the Pacific powered only by the sun. During the first ascent on day one of the flight from Nagoya to Hawaii, the battery temperature increased due to a high climb rate and an over insulation of the gondolas. And while the Mission Team was monitoring this very closely during the flight, there was no way to decrease the temperature for the remaining duration as each daily cycle requires an ascent to 28'000 feet and descent for optimal energy management. Solar Impulse is attempting a historic first of flying around the world only on solar energy. 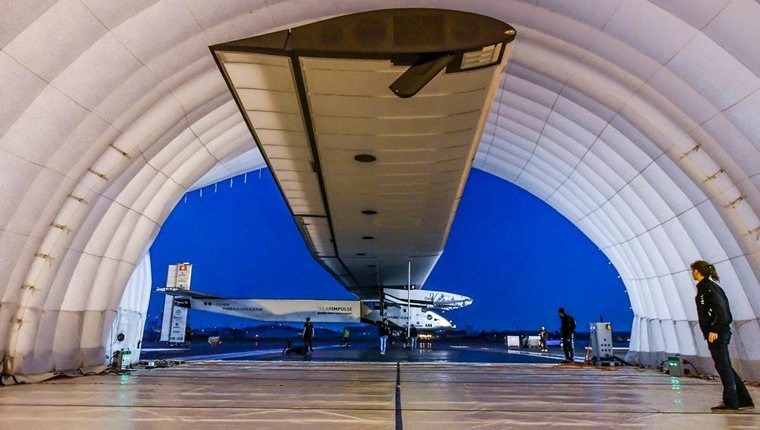 And while Solar Impulse has completed 8 legs, covering nearly half of the journey, setbacks are part of the challenges of a project which is pushing technological boundaries to the limits. 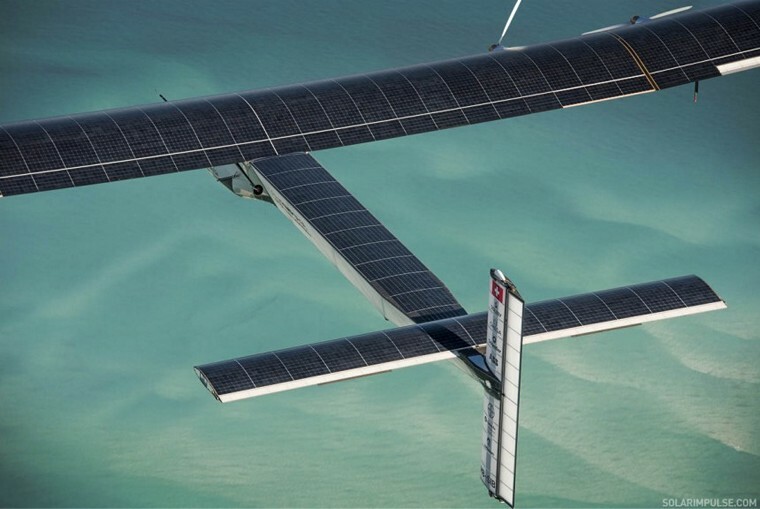 Solar Impulse will try to complete the first ever round-the-world solar flight in 2016 and this delay will in no way influence the overall objectives of this pioneering endeavour.